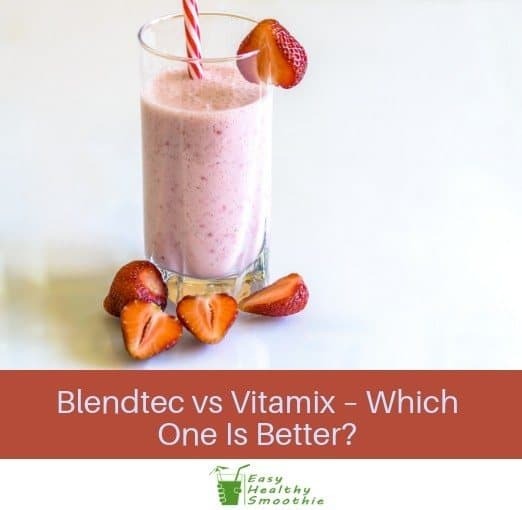 Blendtec vs Vitamix – Which One Is Better? Creating a fresh smoothie for breakfast every day can be easy if you find the right blender for your needs. In order to do that, you need to think carefully about which blender to choose as they aren’t cheap. To help you out in choosing the best out of the brands available in the market, we’ve compared two of top contenders, Blendtec and Vitamix. Blend even the toughest ingredients to help you create a healthy smoothie or meal. Have lots of models to choose from to fit your budget, needs and preferences. Are easy to clean because they are dishwasher safe and easy to wash by hand too. Are highly rated by buyers and have positive customer reviews with only a few concerns or customer suggestions for improvement. There are also other features such as user interface, speed control and overall design that you should consider before choosing a blender to buy. Continue reading our comparison and complete reviews of the Blendtec and Vitamix blenders to help you figure out which one is best for you. Which Blender Is a Good Fit for You? Choosing to be healthy is a life-changing decision and it can be made easier with handy tools and kitchen appliances such as powerful blenders. Blendtec and Vitamix are both well-known, market-leading brands that produce powerful blenders for the health-conscious customer. We understand that it can be difficult to choose one between the two, which is why we wanted to make it easier for you by doing all the research and comparing them side by side. When buying a blender, you don’t just want to look at the price tag. You also have to consider its features to determine whether it will get the job done with minimal effort. The overall power of the blender, including the power of the motor and also how the motor is used with the blade. An easy-to-clean design will save you time cleaning up and make you want to use the blender more. Easy-to-use knobs, buttons, and programs. Blendtec is known for their digitally controlled models, offering a futuristic and modern twist to blending. They also demonstrate the power of their motors through their viral videos called “Will It Blend?” where they blend various items including iPhones and iPads. Blendtec doesn’t rely on the sharpness of the blade but rather on the power of their blenders, which is why they fit 3-HP motor on most units and a 3.8-HP motor on higher-end units. Combined with powerful motors are safety blades which are blunt, thick, two-pronged, and crafted from cold-forged hardened steel. These blenders pulverize even the toughest ingredients. Most of the pulverizing action of the blender relies on the power of the motor so it doesn’t matter if you have a sharp blade or not. Each Blendtec blender comes with either a fourslide jar or a wildslide jar, which are designed to be square or roughly square in shape to facilitate mixing ingredients. Additionally, Blendtec blenders don’t have any tampers but their containers are designed to help ingredients bounce once they hit the flat side then up and down towards the blades. They are also very easy to clean because of the smooth flat sides that don’t have any small corners. Furthermore, these blenders fit well under kitchen cabinets so they don’t take a whole lot of counter space in your kitchen. Blendtec boasts a modern user interface on each of their blenders to allow easy control over each unit. You either push down on flat buttons, swipe or simply touch the screen to control or set your blender. Their blenders also come with programs so you can get repeatable results that you can set and forget. This kind of user interface looks and feels futuristic and modern. Most users are very satisfied with the power of Blendtec blenders because they are able to create smoothies with just about any ingredients. Many also love the size of these blenders because they easily fit below a kitchen cabinet without taking up too much space. However, there are also some users who complain about the noise they produce due to the powerful motor. After seeing what Blendtec blenders have to offer, let’s now see what Vitamix products offer and see if they can match or outshine Blendtec blenders. One of the leaders in blending technology, Vitamix continues to produce powerful blenders. Vitamix blenders use powerful motors ranging from 1-hp motors for the S-Series, 2-hp motors for the C-Series, and 2.2-hp motors for the G-Series and Ascent Series. This, combined with the ultra-sharp blade designed with four prongs and crafted out of aircraft-grade stainless steel effectively goes through any ingredient. Furthermore, a 3-inch wide blade is used on Vitamix’s first-generation blenders like the Turbo Blend and 5200 because of the narrower pitcher, while a wider one is used for second-generation blenders like the 7500 and 5300, due to their wider pitchers. The S-Series comes with a regular 40-oz. BPA-free container and a 20-oz. one for on-the-go and single-serving options. On the other hand, a standard size 64-oz. container is included for the C-Series, which is quite tall and will not fit under a kitchen cabinet but there are smaller 48-oz. and 32-oz. containers available for purchase. Additionally, there are also low-profile 64-oz. containers, which have a wider base and are used in next generation G-Series models. Due to the rounded shape, there aren’t any corners or tiny nooks where food could get stuck, so these blenders are easy to clean. Moreover, all containers except those for the C-Series and G-Series blenders are dishwasher safe and can also be washed by hand. Most Vitamix blenders provide variable speed control except for the Vitamix Turboblend 2 Speed and CIA Creations, which only have a high- and low-speed option. Variable speed controllers may come in the form of knobs or touchscreens like the ones you’ll find on the G-Series. Higher-end models also include pre-programmed blend cycles that combine slower and faster speeds for a certain period of time. A unique feature to Vitamix is the included tamper, which is very useful for creating thicker smoothies or for when you’re just starting to blend and there isn’t much liquid in the container. Most Vitamix blender users are impressed with the design and sharpness of the blade which makes the blender faster—perfect for the morning rush. Others love the tamper because it is very useful, especially when blending tough ingredients like frozen fruits, nuts and seeds. Although many people love Vitamix blenders for their features, some are disappointed with the size of the tall container because it doesn’t fit on all countertops. To remedy this, some simply chose to purchase smaller containers for their unit while others simply chose to store the container side by side with the base and not on top of it. Have you decided which one to get yet? Did the Blendtec blenders impress you or do you prefer the sound of Vitamix blenders? Before you make that decision, here is a recap of the notable differences between Blendtec blenders and Vitamix blenders. Vitamix blenders include a tamper which helps keep the ingredients down to be blended while the Blendtec blenders come with a specially designed square-shaped container to help the ingredients bounce and get blended. Blendtec blenders offer more powerful motors ranging from 3 hp to 3.8 hp while Vitamix only offers motors that have 2 hp to 2.2 hp. Vitamix blades are sharpened and four-pronged, which aids in quick blending capabilities. The Blendtec blade, on the other hand, is blunt and two-pronged, offering better safety. Blendtec blenders offer a more modern user interface combining flat buttons and touchscreens while Vitamix offers a more traditional knob control for most of their blenders and some touchscreen control panel for higher-end models. Choosing between the two brands is a tough decision and the only one who can make that decision is you. It’s up to you to determine which is suited for your lifestyle, budget and preferences. Here, we’ve given you the facts, mentioned some of the pros and cons and shared what other customers have to say about each brand. It’s up to you to choose which one ends up in your home. If we had to choose one, we choose a Blendtec blender because of their powerful motors. Although both brands’ blenders can create smoothies and can aid in creating various healthy recipes, we are impressed that Blendtec models don’t need a sharp blade to function well.